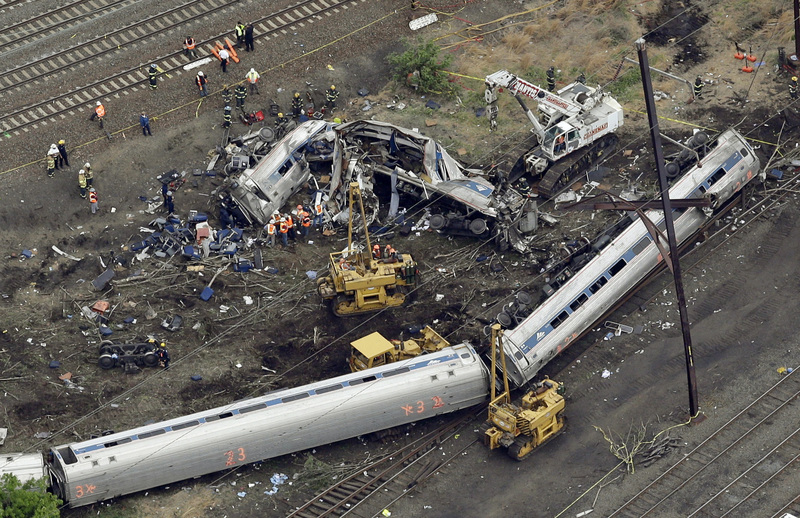 HILADELPHIA (AP) — Amtrak will pay $265 million to settle claims related to a crash last year that killed eight people and injured more than 200 others when a speeding train derailed on a curve. The settlement allows victims to have their awards in hand by June instead of waiting years for lawsuits to play out, their lawyers said Thursday. The deadline to join the settlement program is Nov. 21. “The program basically allows for a judge, with help from two masters, to hold hearings and evaluate damages,” said lawyer Thomas R. Kline, who led the team of plaintiffs’ lawyers negotiating with Amtrak. U.S. District Judge Legrome D. Davis of Philadelphia approved the settlement Thursday. Amtrak had previously taken responsibility for the May 2015 crash in Philadelphia of the Northeast Regional train traveling from Washington to New York. Federal law caps payouts for any one accident at $295 million. Amtrak has agreed to put up the money by Feb. 28. Individuals may get the full value of their claims — or more or less — depending on how far the settlement fund stretches. Victims will have the opportunity to testify at hearings or submit documents describing their ordeal. Some say they’ve racked up millions of dollars in medical bills. A U.S. Naval Academy midshipman, a college dean and several businesspeople — including Jim Gaines, an Associated Press video software architect — were among those killed in the mangled front cars. Award-winning chef Eli Kulp was left paralyzed and can’t use his hands. Federal investigators have concluded the engineer was distracted by word that a nearby train had been hit by a rock. They say engineer Brandon Bostian didn’t realize where he was and accelerated full-throttle to 106 mph instead of slowing down for the curve’s 50 mph speed limit. Amtrak in a statement said it appreciates the court’s help in resolving the litigation but otherwise did not plan to comment. Bostian, regarded by friends for his safety-mindedness and love of railroading, has been suspended without pay since the crash. Amtrak installed an automatic speed control at the Philadelphia curve within days of the derailment, as it had in Boston in 1990 after a speeding train derailed into a commuter train near Back Bay Station. The railroad has since enabled speed technology for all but a small portion of the 450-mile Northeast Corridor. Congress raised the liability cap from $200 million after the Philadelphia crash, given the number of deaths and injuries. Lawyers had argued the initial amount could easily be exhausted. Amtrak agreed not to challenge the legality of applying the higher cap retroactively, said plaintiffs’ lawyer Fred Eisenberg. Under the settlement, the legal fees will remain under the same terms that victims signed with their individual lawyers. That often amounts to one-third of awards in personal injury cases. A few lawsuits over the crash have recently settled for amounts of less than $100,000 apiece, Kline said. Those awards will also be drawn from Amtrak’s total $265 million in payouts, he said.